I left Chicago in cold rain. A massive polar vortex was making its way across the upper plains, heading south, and I was determined to get out in front of it. Driving into the vast open spaces of Iowa on I-80, clouds lay across the sky, fat and heavy. Shapes dreamily materialized only to be pushed aside by others. Great beasts morphed into mermaids. Ships into familiar faces. Grey tinged, they rolled in great waves, forming off-white turrets that seem to climb on the backs of those nearby. Constant gliding movement. Not a moment of stillness. On the ground, pulsating winds moved southward, playing with the few vehicles left on the road. Several times I checked to make sure my windows were closed, the constant high pitched sound of the wind lending doubt. The storm’s southern edge was beginning to brush the outskirts of Des Moines, directly in my path, when the western horizon began to leap and spread in dazzling colors. When I was 16, my buddy Robin and I rode our bikes from Royal Oak, Michigan to his parent’s cottage on Fife Lake. (‘Cottage’ is a bit of a stretch here. It was a small Airstream-like trailer, dropped on the waterfront and never moved. Paradise to a couple of adventurous suburban punks.) I can’t remember which one of us came up with the idea, but I had a crush on a girl who attended nearby Interlochen Arts Camp, which was more than enough to get me to pack my canvas backpack with a few pair of skivvies, a couple of tee shirts, several candy bars and my dog-eared copy of Hemingway’s ‘The Nick Adams Stories’. It took us 3 days to cover the 250 miles. Between us we probably had $15. We were flush. With the exception of my front tire getting caught in the railroad tracks and flipping me over the handlebars less than 10 miles from the start, the three day ride was everything we hoped. We couldn’t ride more than half an hour without seeing a lake. Time was merely a concept. We rode when we wanted and rested when tired, sleeping in fields or parks. The image of my large green wool sleeping bag on the front rack of my bike is a permanent memory. God knows how much it weighed, but it required a rack of its own. When we arrived at Interlochen, Cindy snuck us into the counselor’s cabin for the night. Around 2:00 AM, someone came into the cabin and in a frantic voice said, “Everyone come outside! You’ve got to see this!” I rolled out of my bunk and staggered outside. I had no idea what I was looking at. A thought crossed my mind that the world was ending. The sky was shimmering. Blue-green waves languidly danced across a black backdrop, blotting out the northern star-filled sky with movement and color. Yellow streaks appeared, lacing the undulating surf as it rolled across a liquid sky. Sound ceased to exist. There was only color and movement. I have no idea how long we stood there, motionless, staring at this rare display of nature’s vibrance and grace. I do know that the humbling power of that moment has remained with me all these years. It began with a distant sliver of light. A shimmer. Something you catch out of the corner of your eye and wonder if you really saw something. Then the sliver reaches higher into the night sky. I begin to count beats between flashes that radiate upward. For now there is no sound. Only flashes of light stretching to touch both horizons, north and south. Suddenly the road ahead is awash in lavender and purple hues as lightning begins to intensify and linger. Within minutes, hail covers the road, pinging off the van in various pitches combined to create an almost deafening roar. It is a deep Iowa night, lit only by my headlights and a billion frozen points, before the sky erupts in clear white. Thunder shakes the ground as uneven electric daggers blink in the distance. I am surrounded by light and rich colors. Detailed outlines of cows in the field are visible for an instant, then gone. Farmhouses dance in the light, then fade like an image that plays on your retina long after closing your eyes. As I pulled into a rest area, hail mutated into large ornate flakes of snow, slapping against my windshield. The western horizon explodes in blinding light, followed by bottomless sound. The storm had dropped directly in my path and suddenly I am 16 again. The next morning, sun sparkled on new snow. Temperatures had dropped into the low 20’s and the wind was gusting heavily as I crossed the Nebraska border. For an hour or so it was smooth sailing, with the sun at my back and a mostly cloudless sky to the west. Somewhere between Lincoln and Omaha, things changed. Already heavy winds became stronger. Relatively clear roads began to ice up, leaving cement-like ruts. Blowing snow, with nothing in its path to act as a break, moved in rapid horizontal bursts from north to south. High trucks began to visibly sway side to side. Flocks of birds flying north seemed to remain stationary, suspended in animated flight. Then it began to snow. The overarching feature of a blizzard is the absolute absence of color. Blinding white. Visibility dropped to a few feet and I reduced my speed to a crawl. Up ahead I could barely see blinking lights and immediately dreaded the thought of an accident. When I reached the state trooper, he was waving me toward an exit. On the overpass directly above him, a sign read, ‘I-80 CLOSED USE NEXT EXIT DUE TO BLIZZARD.’ My first thought was, ‘Damn, that’s a poorly written announcement.’ My second thought was, ‘Damn, if I-80 is closed, what are the backroads going to be like?’ For the next 8 hours, I learned what it’s like to drive through Nebraskan backroads, in a blizzard. When I could see the road’s shoulder, it was narrow and then quickly swallowed by a sloping ditch. There was no pulling to the side of the road. In many places, drifts completely covered the two-lane road. Taking on the shape of the particular break in the landscape that allowed it to move across fields and onto the road, drifts shape-shifted on a whim of the wind. Snow crawled up sides of homes and barns. When winds eased, the road became visible. Telephone lines hidden in white, momentarily sprang up alongside dormant railroad cars. Ghostly shapes of horses appeared, heads down, staring silently into the wind. I caught glimpses of cars and trucks, strewn about like MatchBox toys of my youth. Then the wind returned, all became white and everything disappeared. I crawled along until a grainery with a series of silos blocked the wind, affording a spot to park. I sat and listened as the wind found its way between the metal bins and screamed its way south. Objects appeared out of white when the wind died down. I had been driving about 30 feet from this train for some time and didn’t know it was there. As if on cue, the skies cleared just in time to see the ‘Welcome To Colorado’ sign, an unseen hand had forcing the blizzard to stop at the state line. In an hour or so, an outline of the Rocky Mountain Range began to slowly rise from the flat farmland that bleeds into the small towns resting at its feet. Winding through Keenesburg, Platteville and Hygiene, before Route 36 settles into a climbing serpentine, Mt Olympus looming to the north. Passing Lake Estes, the road gently drops into Estes Park, the town that sits on the doorstep of Rocky Mountain National Park. My home for the next few days. In winter, Many Parks Curve marks the end of Route 34 heading west. There is no warning sign along the road that tells you it’s about to end, you just round a curve and suddenly there is a metal barrier across the road with a sign that says ‘ROAD CLOSED.’ To be fair, maps provided by the park point out the closing, which runs from mid-October to Memorial Day. This means the only way to get to the Colorado River Trailhead is to completely circle the park to the south and come up the western edge. A trip of well over a hundred miles, essentially leaving you with two options. Enter the park from the east, as I have done. Or explore the park from the west skirting the Never Summer Wilderness. Until Memorial Day, Rocky Mountain National Park remains two distinct parks, separated by forces of nature. Moraine Park Campground is a series of loops, carved into a pine forest at 8,160 feet above sea level. Each loop has several spaces for vehicles or tents. During winter months, Moraine is the only open campground in the park. There are 77 campsites in winter (244 in summer) and on this evening I was one of perhaps 20 campers scattered about in various vehicles and one brave tent. I take site selection seriously and my philosophy can easily be summed up by one guiding principal. Camp as far away from everyone else as possible. It’s not that I dislike being around people. As a matter of fact, I have been known to be somewhat gregarious when in a group. Rather, it’s when I interact that I want to have some semblance of control. True to form, I backed into a secluded site and promptly fell asleep. A light dusting of fresh snow covered the ground during the night, turning everything white. I crawled out of the van, fired up the two-burner and brought a small pan of water to boil. Poured the water over ground coffee and waited a few minutes before pushing down the lever of the French press. It’s hard to beat a fresh cup of coffee on a cold morning and today was no exception. Temperatures hovered around 25 degrees, but the sun was shining and a good day of hiking lay ahead. But first, another cup of coffee. Bear Lake trailhead is about 10 miles from camp at the end of Bear Lake Road. My plan was to hike to Bear Lake and if the snow wasn’t too deep, continue on to Nymph Lake and then Dream Lake. When I pulled into the trailhead parking area, I was surprised by how crowded it was. For a seemingly empty park, there were a lot of day hikers. I was also surprised to see virtually everyone walking toward the trail in snowshoes. Everyone except me of course. I hike in sturdy boots damn it. I scoff at your snowshoes. I hit the trail and within two minutes was hiking in snow halfway up my calves. I cursed myself for not packing snowshoes. Hiking in deep snow without snowshoes is grueling. I thought hiking up hundreds and hundreds of feet at Great Sand Dunes National Park was as hard as it would get in terms of surfaces. I was wrong. This was plodding in its truest sense. As I struggled to gain elevation, people in snowshoes would smile and casually glide by. At the bottom of a steep section, just as I was about to turn around (I was exhausted and had hiked about 200 yards), a family slid down the trail. Mom, dad, boy, girl. Slid! As the father passed he stopped and said, “Sorry about that. It’s too steep to hike down with snowshoes, so we slide. Good luck. Getting up is easy and the lake is beautiful.” At that moment I asked myself. Am I not a man! Did I not cry when confronted by a rattlesnake! Did I not jump into Lake Superior in October! I thanked the man and literally crawled hand over hand, grabbing branches for dear life, to get to the top of the rise, many times falling in snow just below my waist. There was no way I was going to let a little hypothermia get in my way. I have long ago given up on being taken for anything even approaching an intelligent creature. Much to my delight, the trail began to level off and where the canopy of trees allowed sunlight to fall, snow became spotty and thin. Through a break in the pines, Bear Lake stands round, frozen and snow covered. Directly across the lake a massive boulder dwarfs its surroundings. The sky is perfectly blue. I take a moment and watch people move across the lake. One couple catches my eye. They are holding hands, occasionally turning to look at each other. They are young and the man’s movements remind me of Oliver. I can’t explain why. Perhaps it’s the ease of movement, the casual stride. Or is it the turn of his shoulders? Or the way he looks at his girlfriend? This happens fairly often and in each case I am left wondering what did I see that reminded me of my son. I crossed the lake with images of Oliver dancing in my head. A family on Bear Lake. On the right you can see little Rodney storming off in a huff because he wasn’t allowed to see how far his sister Alice would slide when he tossed her on the ice. To get to Nymph Lake the trail doubles back almost to the trailhead before following a pine forest for a level half mile. Here the trail was spotty. One minute I was ankle deep in snow, then stepping into a muddy puddle where the sun had beaten its own path to earth. Pines branches weighted by accumulated snow, reach across the trail. Of the trail, the snow was pristine and deep. Long’s Peak, Flattop Mountain and Hallett Peak form a distant ring above the lake. In summer, waterlilies adorn the surface of Nymph Lake. Today the lake is frozen and a few scattered people move about on the ice. A woman was wearing a straw hat with a sunflower in the band. She was a fair distance from me, but I could see that she was completely dressed for winter with the exception of the hat. I could also see that she was wearing snowshoes. According to the trail guide, Dream Lake was named because of its “dreamlike qualities; the way it reflects its surroundings like a mirror image, and how it looks different from every outlook.” Obviously written by someone in the summer, on this day Dream Lake did not bare a reflection of its surroundings. Instead it was a long, thin body of frozen water surrounded by sturdy pines and sturdier rock, beautiful in its own right. As I walked along the bank, I tried to imagine the different type of beauty these lakes presented in summer. Hidden by ice and snow, they remain alive underneath. Waiting patiently for another few months of sun, before emerging, moving gently in clear blue. Today is St. Patrick’s Day and I am on a mission to find a good corned beef sandwich in the town of Estes Park. After a long day of hiking in snow, ice and mud, I need something warm. Corned Beef on toasted rye, with melted Swiss and a small swipe of mayo. By the time I get back to camp and clean up (such as it is) virtually everything in town is closed. As luck would have it, a small bar has a sign in the window that simply says ‘Corn Beef Today!’ I walk in a take a seat. The waiter, who speaks with a middle eastern accent, takes my order. “We do not have Swiss cheese,” he says. “We do not have any more rye,” he says, with no trace of embarrassment. I’m beginning to think of Jack Nicholson in Five Easy Pieces. “I have corned beef and a hamburger bun. And mayo.” This said with a perfectly straight face. “But of course.” As if he’s taking to a 12 year old. Believe it or not, the corned beef was tender and juicy, the bun toasted with just a hint of mayo spread evenly. Chips and a dill on the side. For good measure, to round out the evening, there was karaoke. Before you even let your mind go there, I don’t do karaoke. Although there will come a day when I find a bar that has Lou Reed’s ‘Take A Walk On The Wild Side’ and I will end my holdout. Tonight it was a couple of older gentleman singing Merle Haggard’s ‘Okie From Muskogee’ and a young woman dressed as if she just materialized from a cattle ranch, including boots that could kill a cockroach in a corner, incongruously crooning ‘Smoke On The Water.’ I mean, Jesus. Corned beef on a hamburger bun and now this. I finished my iced tea, walked outside into the cold, put my hands on my knees and debated whether I should laugh or cry. 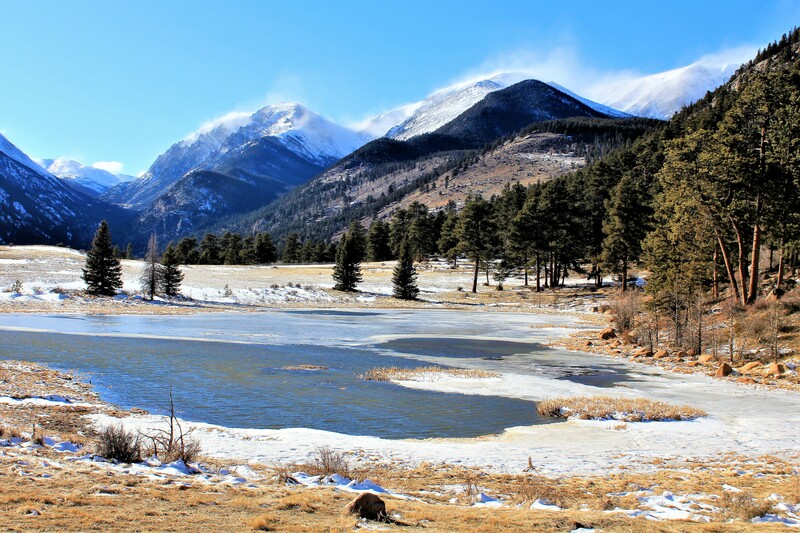 Over a century ago, Abner Sprague dammed a stream to create Sprague Lake as a fishing pond. It’s less than a mile hike around the lake, on an easy weaving trail that mostly hugs the shoreline, which today is muddy and virtually void of snow. It’s an easy well worn trail that offers some stunning views from the far side of the lake. The Continental Divide peaks dominate the horizon. Snow covered and rounded by the wind of thousands of winters, they hover bluish and silent, embraced by clouds. A small fishing bench sits at the edge of the lake. Near shore the water is open and clear. About 25 feet out into the lake, snow and thin ice still hold the water captive. Next to me a small boy creeps down to the water’s edge and puts the toe of his shoe into the water and proclaims the water cold. He scrambles back up to his parents and begins to cry. As I approach the end of the trail, a wedding party is making its way toward me. A full blown wedding party, complete with groom in a tux and bride in a rather long, ornate white gown. As they grow closer I can see that everyone’s shoes are covered in mud. The bride’s gown has a rim of brown along the bottom. One man is on crutches, being held steady by another young man. The crutches are mud splattered. As they pass, I say hello and best wishes. Each of them seem to be in grand spirits, oblivious to the muddy trail. This was their wedding day. This was their plan and by God they aren’t going to let a little mud get in the way of their wedding photos. Man, I love that grit. That determination to work through a tough patch. I would love to see those wedding photos with the majestic mountains in the background. I would take the fact that everyone in the photo has mud on their shoes with a great deal of pride. It’s difficult to drive more than a few minutes in the park without seeing wildlife. Mule deer and elk roam freely across the sunken tree scattered meadows. They move with casual grace until a sound or smell attracts their attention. Then their movements are sharp and quick. Heads jerk up from grazing. Ears become erect and still. They stare unblinking at the source of sound or movement, checking for danger. Sensing none, the head slowly lowers, in stark contrast to the way it was raised. These are beautiful creatures in their natural habitat. We are the visitors. We are the interlopers. In a National Park, you know when someone has spotted wildlife. A knot of vehicles line the side of the road. Everyone is a few steps from their vehicle with a camera or phone to their face. I’ve started a few of these knots and I’ve stopped at more than I can count. This particular group was small, maybe three vehicles. Five or six people were staring intently off into a grove of pines. When I approached, one gentlemen silently pointed into the trees. “A moose,” he whispered. Through a thicket, I could make out what appeared to be moose, but could only glimpse him in small pieces. To my left, cameras furiously beeped focus points as the group snapped shot after shot of the hind leg of a moose. Or the shoulder, or rump. There was no way anyone was getting a clean shot from this vantage point. So what does one do? One changes one’s vantage point. To my right was a small bluff, perhaps twenty feet high. It was covered in scrub pine, fallen trees and boulders. Snow was ankle deep. I scrambled up and waited. If the moose continued moving in the same direction, he would have to pass below where I stood. A minute or two passed and there he was. But still in pieces. I had gained elevation and angle, but several trees still made a clean photograph impossible. I was following his every move through my lens, snapping shots, immortalizing bits and pieces of a moose in the wild. Then his massive head cleared the edges of a pine and he bent to eat. Just before I could bring the camera back to my eye, he looked up at me. Just for a moment our eyes met and we held each other’s gaze. I was so startled to be having a staring contest with a moose I forgot I had a camera. I took one shot before he raised his head and then a few more as he briefly lumbered into a small opening before disappearing into the woods. The photos aren’t great, but I do have a photo of a large moose staring at me. When I returned to my vehicle the others were gone. Cub Lake is 2.3 miles from the trailhead. A bridge over Big Thompson River, leads to snowy open meadows reflecting sun into the dense Aspen forest. It’s a relatively flat hike with the occasional grade. In the hour or so I have been hiking I haven’t encountered another soul. But I did encounter an old, empty plaid stroller. Tiny, with two curved handles, it stood derelict and abandoned by the side of the trail. So incongruous was the sight of a stroller, that I stopped and looked at it for some time. I tried to imagine how it came to be here. Who would even attempt to push a stroller along an uneven, rock strewn path for well over a mile before giving up? I moved on with a million questions floating through my head. All triggered by the sight of a stroller in the wilderness.Sitting by Cub Lake, the aspens sing a little ditty as the wind passes through. It’s a soft wind, only moving enough to make sound. Stone’s Peak keeps the lake company during the long winter. Lesser peaks cradle and surround the lake in bluish-green. The lake’s edge is beginning to shed snow and ice. In places I can see tannin colored rocks resting beneath clear water. I spot a couple of flat rocks and reach into the freezing water. Both look to be perfect skippers. Bending and throwing sidearm along the narrow path of open water, they skip beautifully before finding snow. I find two more and repeat a simple act that brings a burst of childish satisfaction. The sun is beginning to creep lower in the west, so I turn and head back the way I came. Back toward a plaid stroller with perfectly curved handles. Back to one more night before heading south toward a black canyon carved over 2,000 feet into solid rock. I have thought about this stroller many times and the various scenarios that may have placed it there. Still haven’t come up with one that makes sense. Storm clouds gathering above a high meadow along Bear Lake Road. Shot from the walking bridge near Many Parks Curve. You could stand here a thousand times and it would never grow old. I think most people would describe me as friendly. I tell a reasonably good joke and leave the room. Thin sheet of ice resting on clear water. Elk grazing because Uber Eats has yet to be introduced inside the park. High meadow separating great forests of evergreen and pine. Why does everyone think this majestic animal always has a dumb look on its face? Never mind. The Stanley Hotel in Estes Park. Stephen King’s muse for ‘The Shining.’ Walking the grounds I encountered far to many sets of young twins. Previous Photos From The Road. Literally.